Lenses and light have been used to image cells and microscopic structures for centuries. Unfortunately, these systems have always been limited by the power of their lenses. Alternatives have been developed that are much more powerful, like electron microscopy, but their added capability comes with a hefty price tag. Finding an alternative that would allow a greater resolution in common, inexpensive microscopes was a goal for researchers at MIT, according to a recent press release from the National Institutes of Health (NIH). “For centuries, a scientist’s ability to look at cells has been constrained by the power of the lenses they used to magnify them. We decided to try something different, and physically magnify the cells themselves,” said Edward Boyden, Ph.D., associate professor of biological engineering and brain and cognitive sciences at MIT, in the press release. The approach Dr. Boyden and his team took involved linking brain proteins to sodium polyacrylate, which is a superabsorbent compound commonly found in diapers, according to the press release. Once the proteins were bound to the polymer, water was added, and the material swelled, consequently expanding the structures attached to it. Though they were significantly expanded, the normal structures and their relationships to each other were preserved, which allowed them to be visualized. The technique has been named expansion microscopy (ExM) by the team. The swell-able polymer was synthesized around and within the specimen, according to a recent study published by the team in Science. The expansion occurred isotropically, or equally in all directions, which resulted in a physical magnification of the specimens being studied. Using the technique, the team was able to show a lateral resolution of about 70 nanometers in cultured cells and brain tissue. Examples of the detailed structures revealed by the ExM method include cytoskeletal microtubule filaments that have been spaced apart from each other, according to the press release. Neural synapses, the location where two neurons come together to communicate, have also been studied using ExM. 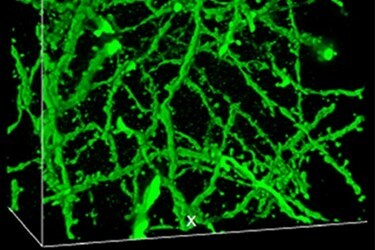 Overall, the technique allows large expanses of brain tissue to be visualized with nanoscale precision, which could be applicable in many areas of biology and medicine. The team’s future plans will include attempts at new combination methods that include ExM to study diseases in brain tissue. Image Credit: Boyden lab, MIT, Cambridge, MA.